The final model was the Alvis TF21 with a six-cylinder engine with triple SU carburettors that developed 150 bhp at 4,750 rpm. With its top speed of 125 mph (200 kph), it was the fastest Alvis ever. 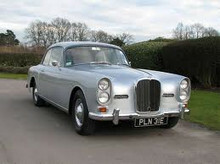 When Rover was in turn taken over by Leyland Motors in March 1967, it meant the end of the line for Alvis cars. From then on the name was solely used for military and armoured vehicles, including tanks, which had none of the refinement of the classic Alvis cars. When Alvis stopped production of motor cars in 1967, the entire division was hived off into a separate co called 'Red Triangle'. They hold all the remaining stock of spares and all factory drawings. Alvis PLC no longer exists as such; it is now part of BAE Systems Ltd. Rough saloons are currently worth Â£1500-2000, rough dropheads Â£5000, fair saloons Â£7500, fair DHC's Â£15000, good saloons Â£15000, good DHC's Â£35000 the best saloons now over Â£30000 and best DHC's are Â£75000.